India dominated the range and the ring as Shreyasi Singh's double trap gold shored up the medal tally while the entire men's Indian boxing contingent made the semifinals to be assured of podium finishes in an unprecedented performance on day 7 of the 21st Commonwealth Games. On the overall medal tally, India held on the third position with 12 gold, four silver and eight bronze medals for a total of 24 so far. This number is expected to jump substantially once the wrestlers begin their campaign tomorrow and the boxing medals are finalised in the next two days. The Belmont Shooting Centre in Brisbane continued to be a happy hunting ground for Indian shooters and for a fourth successive day the country had a medal to celebrate. 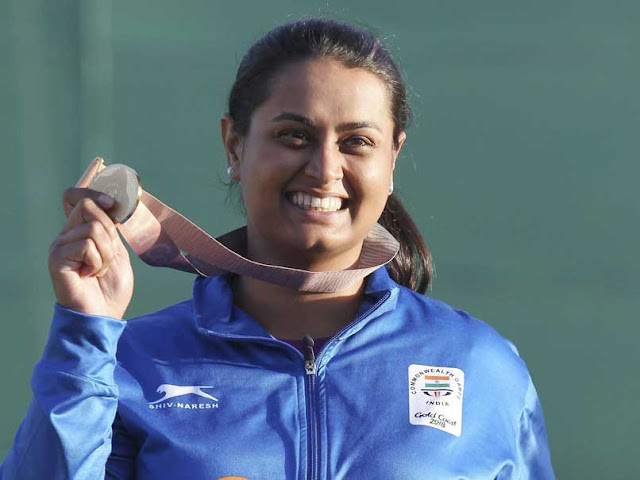 Shreyasi, a silver-medallist from the 2014 edition, beat Australia's Emma Cox in a shoot-off to improve the colour of her medal from the last time. "This is the highest medal of my career, right up there. It is also very special because shooting is not going to be a part of the Commonwealth Games in 2022," said the 26-year-old. "It would be the one to cherish for a very long time," she added. There were a couple of bronze-medallists as well in Om Mitharval (50m pistol) and Ankur Mittal (men's double trap). And some disappointment too as 10m air pistol gold-medallist Jitu Rai signed off 8th in the 50m pistol final. From the range to the Oxenford Studios and it only got better for India. All eight of the male Indian boxers entered the semifinals, while the redoubtable M C Mary Kom (48kg) entered the final. "It was difficult in the sense that this girl would just not come to me. I had to be careful because she was perhaps waiting for me to let my guard down," Mary Kom said of her defensive opponent, Anusha Dilrukshi Koddithuwakku of Sri Lanka. Gaurav Solanki (52kg), Vikas Krishan (75kg) and Manish Kaushik (60kg) joined Manoj Kumar (69kg), Satish kumar (+91kg), Amit Panghal (49kg), Naman Tanwar (91kg) and Mohammed Husammuddin (56kg) in the semis, making for a very happy Indian boxing contingent, shepherded by Swedish coach Santiago Nieva. There was good news from the hockey arena as well with India beating England in their final pool B clash to set up a semifinal with New Zealand. The spark that had been missing so far from their campaign was rediscovered to an extent and coach Sjoerd Marijne said he could finally recognize his team again. On the badminton court, the stars of the mixed team's gold medal winning campaign began their singles run and with easy opponents in opening rounds and the likes of P V Sindhu, Saina Nehwal and K Srikanth hardly took less than 20 minutes each to move into the pre-quarters. Most of the table tennis and squash players made their way into pre-quarters of their respective individual and doubles events. In squash, the spotlight is on defending gold medallists Joshna Chinnappa and Dipika Pallikal, who won their opening match today. There was disappointment in the athletics arena where high jump hope Tejaswin Shankar ended up sixth after fouling all his attempts at 2.27m even though his personal best stands at 2.28m. It's the first time I am experiencing something like this. I still have a lot of big competitions coming up this year. The biggest positive is that I could hold my nerve against these big competitors. I realised they are people like me, they are not gods, Shankar said later. Also finishing sixth was Hima Das, but in the 400m women's race. She could, however, take solace from the fact that she achieved a personal best of 51.32sec.